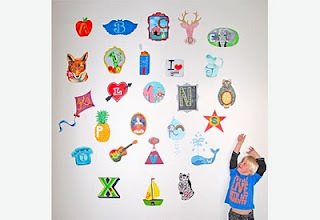 New Zealand Handmade: Christchurch Earthquake Fundraising..
We're stepping outside our normal blog posting timetable to let you know of some fundraising ventures to benefit the victims of last Saturday's 7.1 magnitude earthquake in Christchurch, New Zealand. The video below shows just some of the devastation to buildings - particularly in the CBD. Residents in Christchurch and the wider Canterbury district have had water, power and sanitation facilities affected. Many homes have been left uninhabitable and big aftershocks up to 5.1 on the ricter scale continue to shake the nerves of residents. Police, Civil Defence, the Army, and many volunteer organisations are working to return the City and outlying districts to a sense of normality with the state of emergency status set to continue until Wednesday 15 September, and estimates of rebuilding the city in the $billions. Many schools and businesses remain closed. 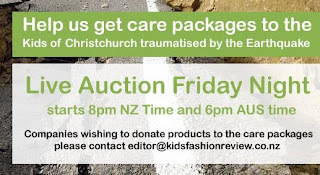 Kids Fashion Review are holding two Auctions - the 1st tonight at 8pm NZ time, the 2nd on Monday 13 September at 8pm.. many businesses are donating fantastic products and vouchers for the auctions including our New Zealand Handmade members ... Lily Pad Designs, Topography, and Estella Rose. A New shop - Felt Aid - is being created at Felt with handcrafted wares being donated to the shop and all proceeds going to the Christchurch earthquake relief effort via Canterbury Red Cross. This initiative is currently being co-ordinated by volunteer Felt sellers and products will be loaded over the weekend. Please join the Facebook Fan page or follow the blog to keep up to date with developments. You can also email feltaid@gmail.com if you wish to be donate products. Sticky Tiki are donating $5 from every sale on their website to the Canterbury Red Cross until the end of September. If you are in Christchurch, please also feel welcome to comment with your experience of the Earthquake and how it is affecting you and yours.